“Flation” is guaranteed in the next few years. We will see in-flation, stag-flation, hyperinflation and de-flation. Many of these flations will happen simultaneously. Currently we have major monetary inflation combined with asset inflation. Credit growth and money printing have in recent years benefited the ailing banking system but have not yet reached consumer prices and therefore there is no ordinary price inflation. In 2017, velocity of money is likely to increase, leading to stagflation which is higher prices without growth. But as the problems in the financial system deteriorate, hyperinflation in most major economies is virtually a certainty. The build-up of debt and derivatives in the last quarter of a century guarantees that desperate governments will print unlimited amounts of money in a frantic attempt to save the financial system. What has happened to the banking system in Italy in recent years makes the Medicis look like saints. Mismanagement and corruption has driven Italian banks to insolvency. The problem is the same in Greece, Spain, Portugal, France, Germany etc as I discussed in last week’s article. But these problems are not limited to Europe. Banks in Japan and China will have the same pressures and so will the financial system in the US and emerging markets. The last financial crisis started in 2006. Since then global debt has gone from $140 trillion to around $240 trillion. Those extra $100 trillion should have led to massive hyperinflation already. Instead all central banks are complaining about deflation and are doing all they can to create inflation. There is a misconception that inflation is good for the economy. Inflation is a disease that leads to the destruction of money and of savings. Lost central bankers have no other solution for a failing financial system. But to solve a problem with the same methods that created it in the first place is the road to ruin. And this is what will happen in coming years and most likely start in 2017. Hyperinflation when it starts normally accelerates very quickly and might last for only 2-4 years until the printed money becomes totally worthless. Hyperinflation affects mainly goods and services. In real terms, all the assets that have been financed by the credit bubble will deflate. Simultaneously debt will implode leading to banks defaulting. Eventually hyperinflation will turn to a total deflationary implosion when all prices go down together with money supply. This will be a devastating period for the world since for a period there will be no money and most people will have to revert to barter. When hyperinflation ends and the deflationary implosion starts, gold will fall from the dizzy highs. But since there is likely to be an extended period without any paper currency in many countries, gold will be the only real money and will therefore be very highly valued in relation to rapidly falling prices. Although there is no sign of hyperinflation in any major economy, there are countries like Argentina and Venezuela where it is already happening. The Venezuelan Bolivar has been totally crushed since 2011. In August 2012, there were 10 Bolivars to the dollar. Today there are 4,250 Bolivars to one dollar in the unofficial market. As the graph shows below the fall of the Bolivar and the rise of the dollar is now exponential. In mid-2015 there were 700 Bolivars to $1 and today the dollar is 6x higher at 4,250. Since Aug 2012, the monthly inflation rate has been 16%. In gold, 17,000 Bolivars bought one ounce in 2012. Today one ounce of gold costs 5 million Bolivars. A sign of things to come to many major economies in the next few years? As I have advocated since 2002, gold is the best way to preserve wealth and to insure against the coming collapse of paper currencies as well as the financial system. We have as a rule advised clients to hold gold rather than silver for wealth preservation purposes. The volatility of silver has made it an unsuitable investment for normal investors. 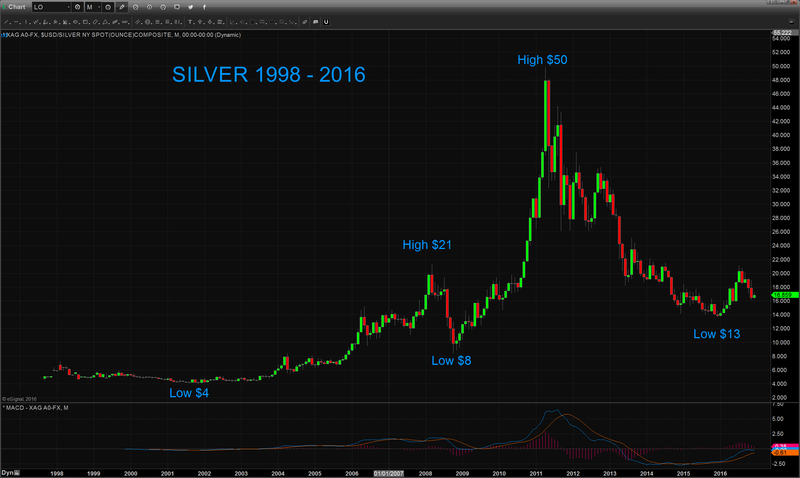 In 2001 silver was $4, in Feb 2008 it reached $21 and in Aug 2008 silver was down to $8. Then back to $50 in April 2011 to again fall precipitously to under $14 in Dec 2015. For anyone seeking a thrilling roller coaster ride, silver is perfect since these massive swings will give most investor the fright of a lifetime. Because silver is also much heavier in relation to its value, it is less convenient to store and carry than gold. In addition, there is Vat (value added tax) on silver in Europe although this can be avoided legally by storing in bonded vaults. The risk/reward situation for silver changed at the beginning of 2016. Silver has now reached a point where relative to gold it represents excellent value. What is particularly interesting is that silver is now in a position to move twice as fast as gold. 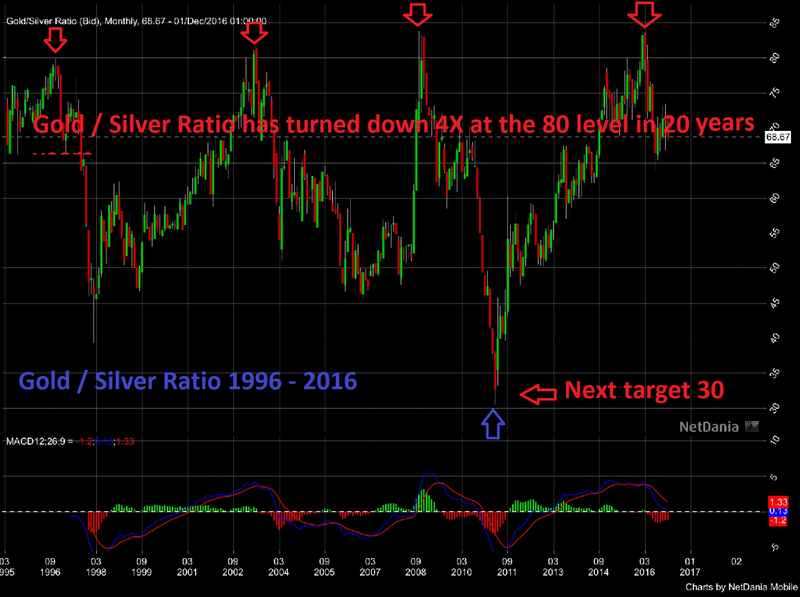 The Gold /Silver ratio chart below shows how it has peaked 4 times in the last 20 years at or slightly above the 80 level (gold price = 80x silver price). The last time this happened was in February 2016. Since then the ratio has fallen to 68 but this is just the beginning. It is likely that before a major correction of the ratio, it could move down to 30 which we saw in 2011 when the silver price reached $50. The ratio can move extremely fast. In September 2010, it was at 68 and in April 2011 it had reached 30. Once the current move down in the ratio accelerates, it could reach 30 very quickly. Longer term the ratio is likely to reach 15 which is an important historical level or it could even overshoot to 10. 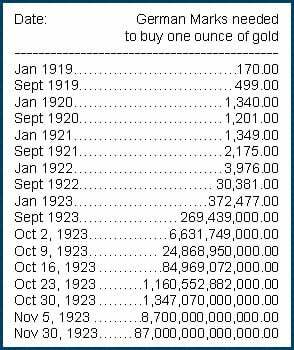 If gold reaches $10,000 which I believe is a minimum without hyperinflation, that would give a silver price of $666 to $1,000. These are clearly levels that sound totally unrealistic currently with silver at $17 but are likely to be achieved within 5 years or so. What makes silver particularly interesting is its scarcity. Around 170,000 tons of gold have been produced in history and virtually all of this quantity is still around in one form or another. This is not the case with silver. There are no significant silver stocks anywhere in the world. Almost 60% of the silver produced is consumed, the rest goes to silverware, jewellery and investment. Central banks hold no silver stocks. The annual global silver production is 27,000 tons which at $17 is $15 billion. As a comparison, annual gold mine production is $114 billion. More silver has been consumed globally than has been produced for a number of years. Investment demand for silver is only $2.5 billion annually. The total size of the silver market is miniscule in relation to world financial assets. That is why it has been very easy for Deutsche Bank, UBS, Barclays and a few other banks to manipulate this market. Deutsche has admitted their rigging of the silver market but since they have implicated a number of other banks, we haven’t seen the end of this story which is very likely to spread to the gold market also. Silver is normally the leading metal. It moves faster down in a bear market for precious metals and when the market turns bullish, it outperforms gold. The fall of the gold / silver ratio indicates that the manipulation might soon come to an end which will lead to increased physical demand. That in turn will put the paper silver market under severe pressure. As physical demand rises, the silver price will increase rapidly. Even today it is difficult to find big quantities of physical silver and as price rises there will be no silver available at current prices. Any surge in demand will only be satisfied at substantially higher prices. 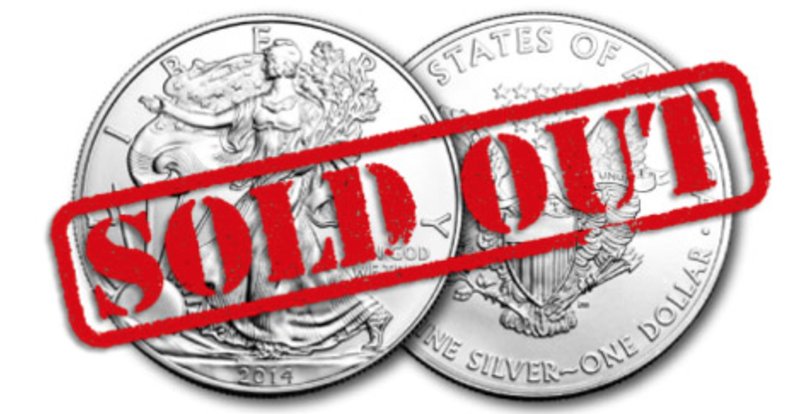 Silver should not be bought for speculative purposes but for long term wealth preservation. Due to the volatility of silver, 15-25% of total precious metals holdings is the right level in our view. For any investor who doesn’t hold silver, it is my strong belief that now is an excellent time to buy physical silver at a price that will never be seen again and for a journey which will be extraordinary.